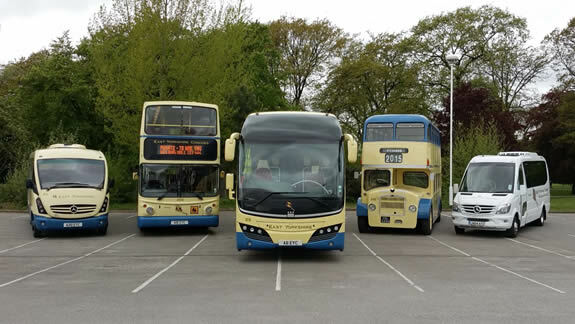 We have coaches suitable for all kinds of different jobs. We'll assign the most suitable coach for your activity, but if you have a preference, please ask when you make your booking. Our Elite coach offers large groups the chance to travel in luxury. Your group will get several screens to watch DVDs, Wi-Fi and USB points to charge or power phones and mobile devices. There are also three-point seatbelts, reclining seats and air conditioning. One of the seats can be converted into a wheelchair space. There’s also a huge amount of luggage space, making this coach ideal for sports teams, or groups with lots of kit. The large number of seats means big groups can save money by hiring one coach, instead of two. Our Diplomat coaches have all the comforts you would expect for a long journey. Reclining seats, air conditioning, toilets and seatbelts are standard on all these coaches, and most also have DVD players for in-journey entertainment. Our Diplomat coaches come with either 49 or 51 seats. For large groups that want to travel in luxury, our Prestige Plus coach is perfect. With unusually generous legroom, double glazing, a washroom, toilet, fully adjustable seats, drinks dispenser, air conditioning, three-point seatbelts and DVD player and screens, this coach carries 53 passengers in comfort. Travelling with someone who finds it difficult to climb the coach stairs? They don’t have to miss out on your trip, as we have two wheelchair accessible coaches, each with a wheelchair lift and ‘parking’ for one wheelchair. Ideal for sports teams and smaller groups, our midi coach has all the comforts of a larger vehicle on a smaller scale. 33 passengers can enjoy the facilities, including air conditioning, three-point seatbelts, armrests, sun-dimmed windows with curtains, individual reading lights and cd player/radio. Perfect for smaller groups, our Executive Mini Coach carries up to 19 people in comfort. As well as three-point seatbelts, air conditioning, a cd player/radio and tinted windows, this coach has the added benefits of reclining seats and LED lighting, which make travelling a pleasure. Travelling with a lot of people? Our double deck coach could be the solution! Carrying 72 people, this vehicle has coach-style seats with three-point seatbelts, plus an entrance ramp and wheelchair space. It’s ideal for school and college trips – hiring one double deck coach can be much more cost effective than hiring two standard coaches. Our double deckers carry up to 72 passengers. Making a short journey with a lot of people? Our double decker buses are just the thing! These low-floor, easy-access buses are perfect for carrying large groups, and are great for school museum and swimming trips, or getting people to and from parties. Our double decker buses can carry up to 71 passengers. Ask about our ‘off peak’ school party discounts!. Our double deckers carry up to 71 passengers.